When learning is fun and fun involves learning, we get a lot more done and kids absorb so much more! Learning Resources is a leader in toys that are not just fun, but educational, too! One of the newest products in their Gears! Gears! Gears! line is the Pet Playland and it is so much fun! I love when products make learning fun! It makes things so much easier on the parents and the child. I know some kids really resist pen and paper but love to do things that are more hands on! This is an awesome giveaway for that child. 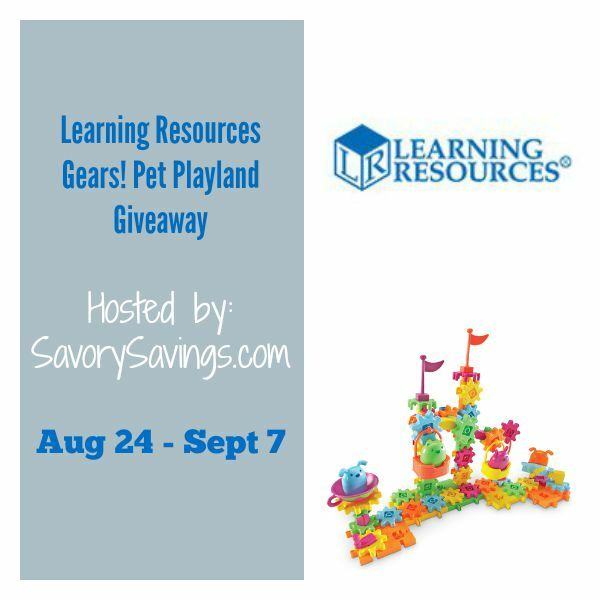 If you would like a chance to win the Pet Playland Gears! Gears! Gears! set, enter with the Giveaway Tool below. If you have won a Learning Resources giveaway anytime from another blog in the last 12 months, you are not eligible to win this giveaway. The giveaway will run from August 24 through September 7, 2015 at 11 PM CST and is open to US residents, ages 18 and older. Entries will be verified. Winners will be notified via email (consider adding gloriouslygreengal@gmail.com to your safe list) – winner will have 48 hours to respond and claim prize or another winner will be selected. I would love to get the teaching cash register for my precioua nephew! I’m getting ready to teach my littlest one her letters and I think the Magnetic Letter Construction would be a perfect learning tool. I think she’d like the Vowel Owls™ Sorting Set, too. My older kids would reach enjoy the Create-a-Maze. This would be a great Christmas Present or Birthday present for my little guy! Such a great review! I like the fresh fruit salad! Thanks so much for the chance to win! My nephew would love the Gears! Gears! Gears!® Lights & Action Building Set! The Gears! Gears! Gears!® Lights & Action Building Set looks fun.